It’s 18th Century Britain and Queen Anne is being petitioned by her government about when to end the expensive and politically explosive war with France. Queen Anne (Olivia Colman) is ailing and executive power is effectively being wielded by Sarah Churchill, Duchess of Marlborough (Rachel Weisz), who has the ear of the Queen in many ways while her husband is leading the British army in battle against them. In the middle of this delicate position arrives one of Churchill’s cousins – Abigail (Emma Stone) – who has fallen on hard times and appeals for a job. Taking pity on her, the Duchess gives her a job as a maid where she soon attracts the attention of a dashing soldier. A clever woman, Abigail soon worms her way into Anne’s confidence, becoming a very real rival to Sarah for the ailing monarch’s affections. Where Sarah is outwardly stern and conservative, Abigail appears to be more kind and agreeable to Anne who quickly takes a shine to Abigail and the two engage in battle to curry favour with Anne who is depicted as a weak, eccentric woman, easily led by her favourites but perhaps liking the attention she’s getting. The question, now, is who is using who and for what reason as each of the women begin to ignore bigger issues in their life and instead begin focussing on each other for different reasons. The three way power play is seen through some very wide lenses which frame scenes, giving the usually dry period drama motifs which are cast aside in favour of some edgy angles and a soundtrack that keeps the tension high in a very unusual way. 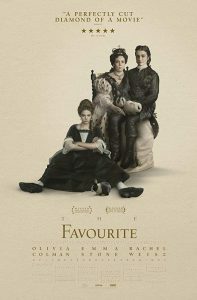 The Favourite has some very funny moments but there is also sadness and tragedy in Queen Anne’s backstory, illustrated by the 17 rabbits she keeps, which seems to inform her attitude to the attention she gets from the warring women. The men in this film are relegated to the edge of the expansive frame while the women get on with their personal battling in this semi fictionalised dramatisation. Emma Stone’s British accent is flawless as she plays the outwardly kind Abigail, Olivia Colman turns in another layered performance as an eccentric Queen Anne, while Rachel Weisz showed only tenderness beneath a businesslike exterior as Sarah. It’s not a film for prudes but it’s well worth a look as it’s bagged a pile of Oscar nominations – all three main actresses give great performances although the finale is does allow reflection about just who you would side with in the end. Summary: THE FAVOURITE is a period drama in which a servant and a courtier vie for the affections of their monarch, Queen Anne. This entry was posted in Shooting The Breeze and tagged Emma Stone, film review, Olivia Colman, Rachel Weisz, The Favourite. Bookmark the permalink.